The 1st North Berwick Bear Cubs had a fun filled, action packed summer term spending most of their sessions outside. 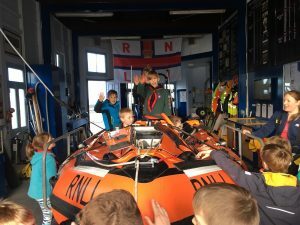 They visited the North Berwick RNLI station where the RNLI volunteers spoke about the work they do and the equipment they use. The Cubs learnt how to enjoy the water around North Berwick safely and hopefully we have some future RNLI volunteers amongst us. The pack also went on a number of hikes along beaches, through woodland and around lakes. They learnt about the Countryside Code, local wildlife and health and well-being. 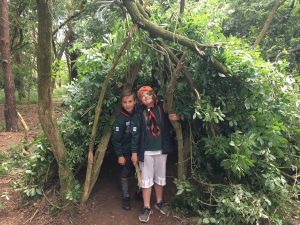 They made some fantastic dens thanks to a storm that brought down lots of branches just before our session! 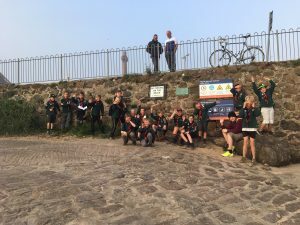 The Cubs also went to Auchengillan Camp with over 100 Beavers, Cubs and Scouts from North Berwick, visited Concorde and built volcanoes on the beach. 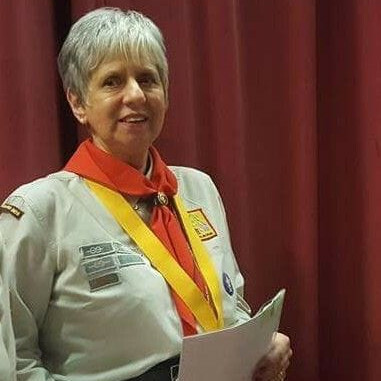 Congratulations to Diane Ross on being awarded an MBE in the Queen’s Birthday Honours in recognition of her service to Scouting and to the community in Edinburgh. Diane was a Leader for the Cub Scout 80th Birthday item in the Edinburgh Gang Show 1996, was instrumental in the organisation and running of the Junior Gang when it was established in 1997 and remains an ardent Gang Show supporter. Her leadership and commitment to Gang Show, as well as many other responsibilities in Scouting, is inspirational. Thank you Diane for your service and here’s to many more years of Scouting fun! The UK website has a series of badge support blogs which provide activity ideas and tips for a range of Activity Badges, Staged Activity Badges and Challenge Awards. There is material for all sections. 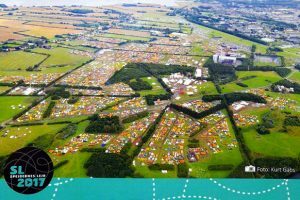 The Scottish Campsite Directory has been updated (April 2018) and is a useful resource. The UK directory, which lists some Scottish sites, is also available at UK Scout Campsite Directory . 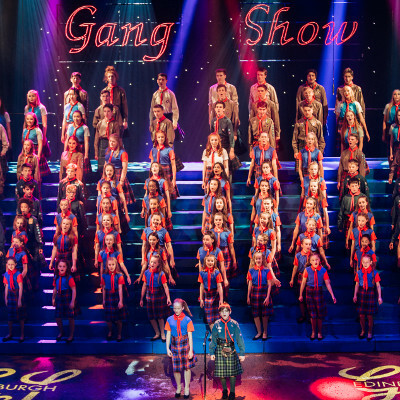 The Edinburgh Gang Show is a major theatre production and has been staged annually at the King’s Theatre since 1960. The cast is made entirely of members of Scouting and Girlguiding and is supported behind the scenes by many adult volunteers. Being part of the Gang Show is great fun but hard work and a high level of commitment to the show is expected. All individuals who wish to audition for Main Gang must be at least 10 years old at the date of the Dress Rehearsal (19/11/18) and an active member of a Guide Unit or Scout Group at that date. In addition, all who audition for Main Gang must also be an active member of the Guide and Scout Association at the date of the audition (a date which varies from year to year but this year is 13/05/18). Older Brownies and Cubs at the date of the audition may become members of the Main Gang provided they meet the age and membership criteria by the date of the Dress Rehearsal. Results of the auditions will be advised on the day. If successful, further auditions for song, dance and sketches will take place in June with rehearsals commencing for Main Gang in late August. With the exception of a couple of dates, rehearsals will be held every Sunday from then through to show week. Cast members are expected to attend regularly and show a high level of commitment to the show. After the auditions, a rehearsal schedule and a Registration Form (to be signed by a Section Leader) will be issued to those who have been successful, along with other information. To aid with registration on the day please complete the Audition Form in advance and bring to the audition along with the Activity Information Form. Further information available by e-mailing edingangshow@hotmail.co.uk. Note: Cubs do all performances. Cubs must be at least 8 and a member of a Cub Pack at the date of the audition (a date which varies from year to year but this year is 27/05/18). As a member of Junior Gang, they must remain with their Pack until after the show week. Cubs will be told the results of the auditions on the day. If successful, rehearsals will commence for Junior Gang in September. After the auditions, a schedule of rehearsal dates and a Registration Form (to be signed by a Section Leader) will be issued to those who have been successful, along with other information. 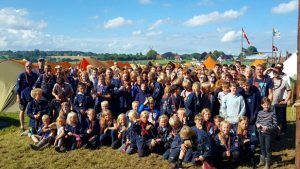 Last summer the Danish Scout Associations came together to run a National Jamboree. 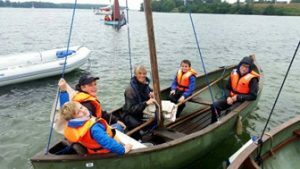 Having experienced fantastic Danish Jamborees several times before, a contingent made up of 65 Cubs, Scouts, Explorers, Network and Leaders from 4th Braid, 103rd Braid and Greenbank Explorers embarked on a trip to Jamboree Denmark 2017. We travelled by coach to Newcastle and then overnight ferry to Amsterdam where another coach took us the almost 9 hours through Netherlands and Germany into Denmark. Our kit travelled on the same ferry in a large van. Feedback from the young people was that the coach to Newcastle was a bit cramped (5 seats across) however that this was more than made up with the “luxury” coach we’d hire for the continent. downside of the time of our method of travel was that we had to pitch our sleeping tents as it got dark. Only one modification required in the morning as we’d pitched one of the leaders’ tents over a ditch. With such a large group, we had decided to bring a marquee without the side walls which was quickly pitched before breakfast on Sunday morning. 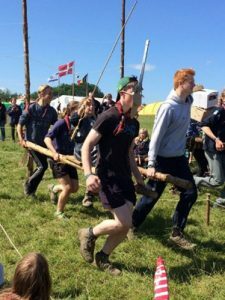 The Danes are very traditional in their camping with a focus on skills such as pioneering and an expectation that food is cooked on open fires. We therefore spent most of the day on Sunday building our fireplaces, tables and benches, true Danish style out of pioneering poles (topped off with plywood table tops we’d prepared and brought from Edinburgh). Throughout the day on Sunday we also took some time to explore the site (which was 2km x 2.5km large). After lots of hard work on Sunday it was time for the evening opening ceremony. This brought together all 40,000 participants. This was quite an experience, although some of our young people found it difficult to follow, as unsurprisingly it was mostly in Danish. During the week the young people took part in a wide variety of activities. There was a good mix of activities to suit our full age range. Some of the activities we had signed up individuals or groups in advance, some we could just drop in to and others were set activities for the whole group / sub camp to do. 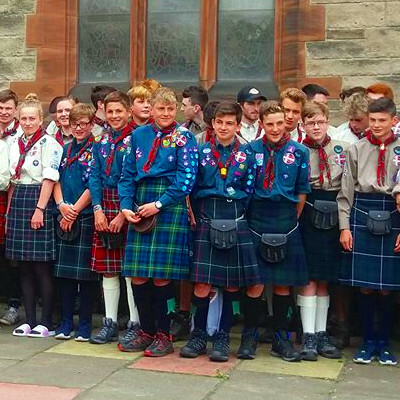 For many of the activities the Scottish Scouts took part alongside Scouts from other countries and made new friends. One activity that was a favourite with both Scouts and Explorers was the world’s largest inflatable “The Beast”. A couple of days of activities featured patrols of Scouts paired with a patrol from another country and going around a variety of challenges. 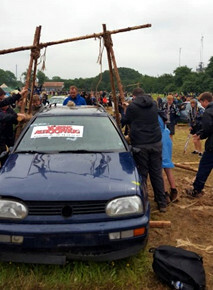 These activities ranged from carving whistles, lifting a car with pioneering poles & pulleys to launching water rockets. One day was designated a sub camp day when the whole of our sub camp came together to build and race chariots. One afternoon we held a joint camp fire with our Danish neighbours. Having been apart for most of the day, our group came together each evening to eat our dinner under our marquee. 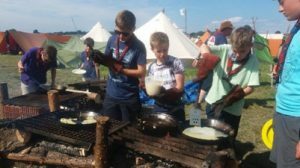 Explorers and Scouts take turns days about to prepare dinner for everyone using recipes from the Danish Camp Cookbook and a bit of improvisation depending on what ingredients could be sourced from the food supply tent. After a great week the camp finished with the closing ceremony. We then departed the site about 3am to travel back to Amsterdam. We made good time and had a few hours explorer the centre of Amsterdam before taking the ferry back to the UK. 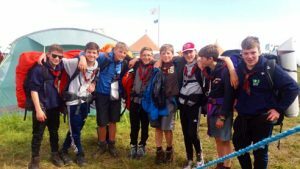 Pre-expedition fundraising involved parents as well as young people / leaders and therefore generated new areas of support for both groups and the unit. Greater independence and confidence especially of younger scouts. Each Jamboree, even ones in the same country only 9 years apart, can be very different. Make more effort, earlier, to make links with the Danish Group we were to camp next to. 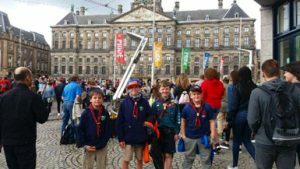 Rather than leaving camp in the early hours of the morning it would have been better to leave around midnight after closing ceremony and to travel through the night, then spending almost a full day in Amsterdam. We would like to thank the William Lyburn fund for the grant we received. The Explorers enjoyed two excursions into town including pizza lunch and swimming. 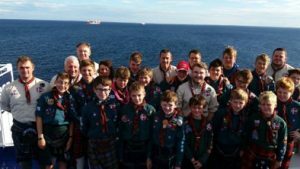 The Scouts enjoyed a swimming excursion into town and a movie in the cinema on the ferry. Office hours: 09:00-17:00 Mon. to Fri.